(Nanowerk News) Chinese scientists say they have developed the world's lightest material, which they expect to play an important role in tackling pollution. With a density of just 0.16 milligrams per cubic centimeter, a sixth that of air, graphene aerogel - which is also known as carbon aerogel - has been developed by Professor Gao Chao from Zhejiang University in Hangzhou. He said the most significant qualities of the new material are its ease of manufacture, and its strong oil-absorption. 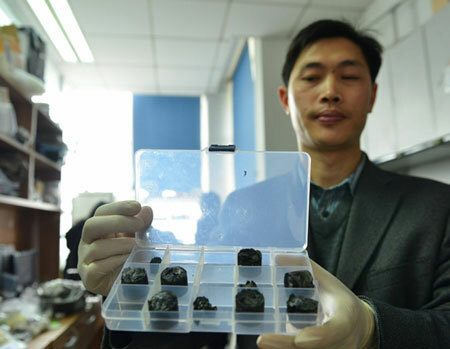 A Zhejiang scientist displays the world's lightest material, which has a density of only 0.16 mg/cubic centimeter, onesixth that of air. The material is derived from a gel, with the liquid component replaced by a gas. It appears in solid state with extremely low density. "Carbon aerogel is expected to play an important role in pollution control such as oil spill control, water purification and even air purification," said Gao, whose research paper on the material was first published online in the academic publication Advanced Materials on Feb 18 ("Multifunctional, Ultra-Flyweight, Synergistically Assembled Carbon Aerogels"), and in the research highlights column of Nature magazine. In addition to being used in pollution control, carbon aerogel is expected to become an ideal material for energy storage insulation, as a catalytic carrier, and in sound absorption. For years, scientists around the world have been looking for ways to produce the lightest known material. In 2011, HRL Laboratory, the University of California Irvine, and California Institute of Technology cooperated in developing nickel aerogel with a density of 0.9 mg/cubic centimeter, the record lightest material at that time. The aerogel developed by Gao and his research team was produced using freeze-dried solutions, which removed the moisture from carbon nanotubes and graphemes but which retained their integrity, creating what is now believed to be the world's lightest material. "Carbon aerogel is similar to a carbon sponge in structure. When an aerogel the size of a mug is put on slender setaria grass, its blades do not bend," Gao said. Despite its fragile appearance, carbon aerogel also has excellent elasticity and bounces back when compressed. It is also one of the most oil-absorbent materials. Current oil-absorbent products usually absorb organic solvent about 10 times their own weight - the newly developed carbon aerogel can absorb up to 900 times its own weight. Aerogel can also absorb organics quickly: 1 gram of aerogel can absorb 68.8 grams of organics per second, making it ideal for treating oil spills at sea. The freeze-drying approach makes the aerogel production process more convenient for mass production and application, said Gao, adding the research team is conducting further research on its absorption performance, as well as other applications.